Is there a list of all available crewmembers for hire and/or rescue I can find, along with their specialties? I know I can see that in the astronaut complex, but what about the ones I need to rescue first (e.g. Judith and Glemuth). Call me curious, but I would like to know what more about who I'm coming for and what they can bring later in case I want to use them again. If a complete Kerbalnaut directory already exists, can you please post the link? Thank you. Do you mean all the ones totally available in the game? AFAIK that's not possible, they're randomly generated when they become available in the complex or when they get placed in a rescue contract. For the rescue ones, you could probably open up your persistent.sfs file and search for the kerbal's name to see what specialty they are. Okay. I found the persistent.sfs file on the saves > BASA folder and tried opening it, but couldn't. How do I do that? You should be able to open the file with any text editor. So right click and go to open with, then open it with whatever text editor you want, like notepad. If nothing shows up, then open up the editor and do file->open and navigate to the file. She's stuck in a Mk. 2 cockpit that's out of electricity and monopropellant. Whether or not the cockpit will have a docking port is of no concern (it'd be nice if it did): I managed to rescue Judith when she was stuck in a Mk. 1 cockpit by switching to her when the tip of the crew transit vehicle was 10 meters away from her wreck. As long as I'm looking at the .sfs file, how do I resurrect Val? I left her to die over Kerbin's seas while completing a survey contract. I think if I change "state = Dead" to "state = Available," she'll come back. However, the code also says "17 = Die" and "18 = Die" after "17 = Flight,Kerbin" How do I deal with that? There's actually an easier way. In your save's difficulty settings, you can set if crew respawns and how long it takes for them to do so. I believe default is "on" and "2 hours"
They never will, they'll always be hanging out there in a single part craft. No dice on the pause menu or the Alt-F12 settings (Val's not missing, she's dead), but at least I can create my own Kerbals for free (e.g. Jack, Mason, Tayo). As for the rescue contracts, should I expect to see plane cockpits without any docking ports. - also, any ideas on how to grab them if EVA is not possible? AFAIK they're always level 1, so they can always EVA out, and you shouldn't even get the rescue contracts until you have EVA capability. The only other option is to capture the thing in a cargo bay or with the klaw (and hope it survives re-entry) - but by the time you're able to do that you're way past being able to EVA. Your respawn settings are under difficulty settings in the pause menu. Does it not work if they're dead-dead? I guess I've never looked into it. when you accept the rescue contract, the to-be-rescued Kerbonaut does show up in your astronaut complex as assigned, even though it's not part of your roster yet. No need to open the save file for that. Check the 'assigned' tab -you'll find them there. Or ditch it before re-entry, no need to bring it back if you don't need to. That makes crew transfer easier. Or just leave the debris there while I take the crew. That's what I did while saving the two astronauts from their cheap cockpits. Something to keep in mind with rescue contracts: beware of them on modded installs. AFAIK the craft given to kerbals needing rescue is randomly picked based on what parts have crew capacity, which can include modded parts since the game doesn't check for any other factors besides crew count. Many common mod parts have crew capacity but no hatches to allow EVA, such as inflatable habitat modules, meaning you'll need to return the entire part with the kerbal trapped inside. A dedicated rescue craft with everything you might need (klaw and a large cargo bay to secure and shield bulky parts from re-entry) is required in the unlikely but possible event that one of these parts is chosen, and is one field where space shuttles are exemplary. Though they might be a bit advanced for the stage of a career game you'd start doing rescues at, they're very handy in later game when rescuing kerbals is cheaper than recruiting them. @Mars-Bound Hokie howdy there. I have a solution on how to bring Val back from the dead via editing your persistent save. Step 1: Make a backup copy of the save in question and store it outside your KSP folder. I suggest this as a precaution only. 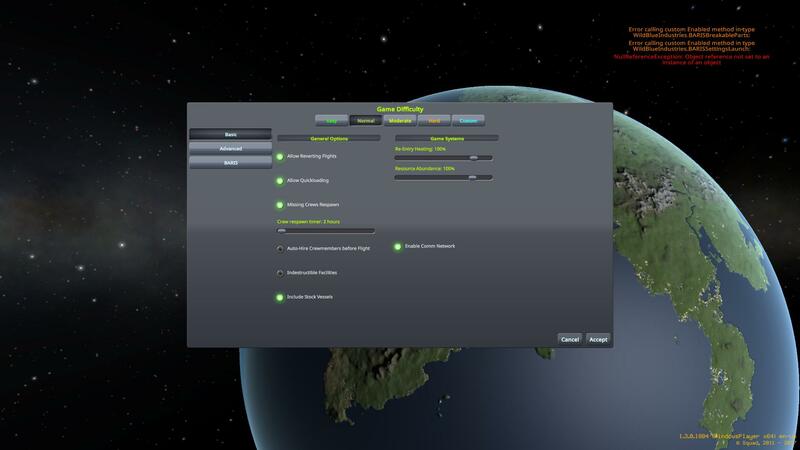 Step 2: locate in your save ANY living kerbal that is available and check for that Kerbals current state. If memory serves it SHOULD be state 0. It has been more than a year since I have done this which is why I am having you reference a Kerbal in your Astronaut Complex as that state is the value you want for our final step. Step 3: Locate Val in your save. If memory serves it SHOULD be state 3. Again I have not had to do this in over a year so I am foggy on the numbers, but I know you want to change her state to match your referenced Kerbal in your astronaut Complex. Once done save twice and reload KSP and check your Astronaut Complex and val should be alive and well. Hope this helps.